This month’s rider interview comes from Tim Stainthorpe, Director, Eclipse Group. 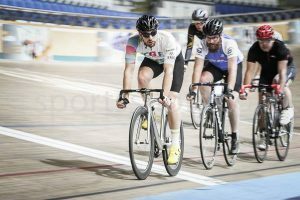 Tim led the team from Eclipse Group, consisting of Tony Godson, Matt Randall, Dave Dutson, Neil Loake and Rob Terry, in our Derby Arena challenge earlier this year. Here’s how Tim felt about taking on Cyclone24 following the challenge. It sounded like a good way of getting a team of Eclipse colleagues into cycling, a couple of us had tried track before and were looking for another team event to take part in and a 24 hour challenge seemed hard enough, and far enough away at the time to consider! Personally, I’m a 4 days a week recreational cyclist so didn’t do anything specific apart from a stage 2+ session to remind my legs they can’t freewheel. The others did some indoor cycling on Zwift and some track stage 1&2 sessions at Derby. To be honest we didn’t do enough and underestimated the physical and mental toll ! Standout memories are the first and last stints. First stint was go hard or go home! Adrenalin was high and common sense wasn’t top of the list and I hadn’t warmed up properly… consequently the legs were sore for the next few stints until pain became just a concept and tiredness took over. Also the final few laps when everyone who had done their stint was cheering the last few riders on, especially when the bell rang to signal the last laps. It was quite an emotional moment realising what we’d all achieved. We were all very tired, counting down our stints until it was one stint left, one final push. We’d had to change our sleep strategy as one of our team became ill early on and so were getting slower and slower! I’d saved some energy to have one big final 25 minute stint and to try and get the fastest lap out of our team, which had suddenly become a ‘thing’ in the middle of the night. So feelings around the team were of relief, exhaustion but accomplishment. Get plenty of sleep in advance, have a strategy for changeovers, take plenty of food and comfy seating, invite friends and family to cheer you on – it really helps. The Eclipse Group team completed 3265 laps, over 500 miles with a their fastest lap being 18.98 seconds. Pretty good going we say. And we’re rather hopeful to see them again in 2019.